CAJUN TIMING is proud to offer a range of cutting edge timing services to fit your budget! Race Planning Guide - A guide to help the race director and their team in planning and organizing their event, which is available on this website. Advertisement – We will post your Event Details on our website Events Calendar and include on our Facebook page. We will also promote it in our newsletter. Online Registration – We provide online registration through our website, manage your online registration needs and give you full control to the data, at no cost to the Event and low-cost processing fees to registering participants . 1 RFID Ultra Disposable Chip Timing System for Running and Biking Races or Reusable Ultra/HDD Chip Timing System for Multi Event Races for Chip Timed Races. 3 Time Machines for Electronic Manual Timing. Disposable Chip Timing Tag (attached to the back of the bib) for each Participant or Reusable Chip Timing Tag and Ankle Strap with Tent Setup for Chip Pick Up for Chip Timed Races. Backup Timing Devices- Time Machines for Backup Timing for all races. 12’ or 15’ Inflatable Finish Line Arch Setup. Your finish line setup will be functional and attractive with ample chute material to direct runners to race end. Race Day Registration – Our team is capable of manually entering the data from your race day entry form directly into our timing program so you can have race day registration. Results – We begin printing Results Reports shortly after the first few runners finish and throughout the race. These reports are posted on our A-Frame Results Display Boards so participants can see their results and verify their information. 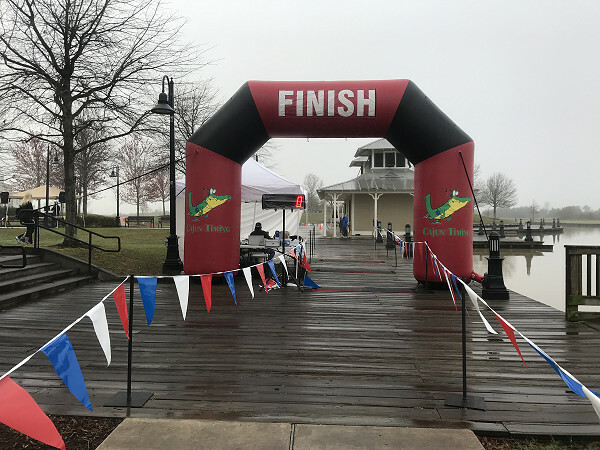 Official Finish Results will be given to the Race Director immediately after the finish so that Awards may be announced while the racers are still at the event. Live Results - Live results uploaded to the web available within minutes of finishing for participants, fans and families to their smartphones or tablets at no cost. Results Kiosk with Printer - Individual personal results that shows their Overall Time, Finish Place Position, Out of Gender Place and their Pace. It has the Name of the Event, Date and their Name. This is printed on a 2-1/4" x 4" adhesive label as a keepsake all at a low cost.